A replica of the coffin used for Abraham Lincoln, on display at the Museum of Funeral Customs. A coffin, or casket, is a funerary box used in the display and containment of deceased remains for burial or for cremation. Any box used to bury the dead can serve as a coffin; such containers are generally used to protect and aid in the preservation of a body. While generally of a rather standard design, made from wood with a lining to make the deceased look comfortable, cultural as well as individual variation does exist. For those for whom cremation is the method of disposal, the coffin may be simplified or even rented solely for the funeral service with the body removed prior to the cremation. An urn or other receptacle then being provided for the ashes. In other situations, more spiritual considerations may be important. Thus, for those who believe the spirit of the dead must be restrained within the coffin, wrapping the body and sealing it was significant. For others, preservation of the body through mummification was significant. While for others still, returning the body naturally to the earth is the priority. Thus, the nature of the coffins used in a particular society or by an individual can reveal much about their beliefs, or lack thereof, in an afterlife and the relationship of the physical body to the eternal spirit and to the earth. The word coffin is derived from the Greek word kophinos meaning “basket.” In English, the word was not used in a funeral sense until the 1500s. Use of the word "casket" began as a euphemism introduced by the undertaker's trade in North America; a "casket" was originally a box for jewelry. Many professionals draw a distinction between "coffins" and "caskets." A coffin is a tapered hexagonal or octagonal box used for a burial. A rectangular burial box with a split lid used for viewing the deceased is termed a "casket." When a coffin or casket is used to transport a deceased person, it can also be called a pall, a term that also refers to the cloth used to cover the coffin and to those carrying the casket, known as “pallbearers.” Receptacles for cremated human ashes, sometimes called “cremains,” are called urns. The handles and other ornaments, such as doves, stipple crosses, crucifixes, or masonic symbols that often adorn the outside of a coffin are called “fittings” or “coffin furniture.” Organization of the inside of the coffin with various draperies is known as "trimming." Anthropoid coffin, fourteenth-thirteenth centuries B.C.E. Various religions have believed coffins to confine the spirit of the dead, and often employed caskets in burial to prevent the spirit of the deceased from visiting the world of the living after death. In early primitive societies, bark, animal skins, or basic mats were used to wrap the body before burial practices. Societies living close to large rivers or shores often buried their dead in canoes or other floating containers. People of the Bronze Age are believed to have used hollow oak coffins to bury their dead, while the early Greeks and Chaldaens often sealed their dead in clay containers. Ancient Egyptian practices used large stone coffins, known as sarcophagi to contain the bodies of the dead, mainly citizens of great social stature. 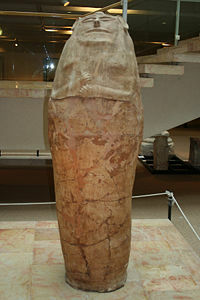 Egyptians also used materials of wood and papier-mâché to craft mummy chests. Coffins lined with more resilient materials such as metal or lead date back to the Middle Ages. In the eighteenth and nineteenth centuries, many Taiwanese coffins were constructed of crushed oyster shells. Today, most coffins of the Western World are crafted out of wood and may be adorned or lined with elements of bronze, copper, lead or zinc. 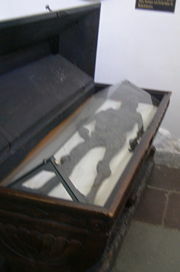 The glass-covered coffin of the Haraldskær Woman. A coffin may be buried directly in the ground, placed in a burial vault or cremated. Above ground burials are housed in a mausoleum, often a large cement building on the grounds of a cemetery, or a small personal crypt. Coffins can be made of many materials, including steel, various types of wood, and other materials such as fiberglass. Recent manufacturing has led to the invention of environmentally friendly coffins made entirely of natural materials such as bamboo. Cultures that practice burial often have widely different styles of coffins. In some varieties of Orthodox Judaism, the coffin must be plain, made of wood, and contain no metal parts nor adornments. These coffins also use wooden pegs in place of nails. In China and Japan, coffins made from the scented, decay-resistant wood of cypress, sugi, thuja, and incense-cedar are often used. According to various African traditions, elaborate coffins may be built in the shapes of mundane objects, such as automobiles or airplanes. Sometimes coffins are constructed to display the dead body, as in the case of the glass-covered coffin of the Haraldskær Woman, on display in the Church of Saint Nicolai in Vejle, Denmark. With the resurgence of cremation in the Western world, many coffin manufacturers have begun providing options for those who choose this method. For a direct cremation, a typical urn or similar container is normally used. Those who wish to have a viewing or traditional funeral service may use a cremation coffin. Family members may choose to use a coffin made of wood or other materials like particle board. Others may rent a regular casket for the duration of the services. These caskets have a removable bed and liner which is replaced after each use. There are also rental caskets with an outer shell made to look like a traditional coffin and a cardboard box that fits inside the shell to house the remains. Viewing Casket, The Museum of Funeral Customs. In the United States, a number of companies produce caskets; some manufacturers refrain from selling directly to the public, and work only with licensed funeral homes. In such cases, the funeral home may sell the casket to the family of a deceased person as part of the services offered. Often, funeral homes may have a small showroom to present families with the available caskets that could be purchased for a deceased family member. In many modern funeral homes the showroom will consist of sample pieces that show the end pieces of each type of coffin that can be used. They may also include samples of the lining and other materials that can be chosen to adorn the coffin. This allows funeral homes to showcase a larger number of coffin styles without the need for a larger showroom. One manufacturer of caskets is the New Melleray Abbey of rural Peosta, Iowa. The monks of this abbey build wooden caskets and urns for their own use, as well as for sale to the general public. The caskets are popularly known as Trappist Caskets. Today, manufacturers of coffins often include features to protect the body. For example, some manufacturers may offer a protective casket that uses a gasket to seal the casket shut after the coffin is finally closed. Manufacturers may also offer a warranty on the structural integrity of the coffin. However, no coffin can adequately preserve the body, regardless of whether it is a wooden or metal coffin, a sealed casket, or if the deceased was embalmed beforehand. In some cases, a sealed coffin may actually accelerate the process of decomposition. An airtight coffin, for example, may foster decomposition by anaerobic bacteria, which results in a putrefied liquification of the body; all putrefied tissue would remain inside the container, only to be exposed in the event of an exhumation. A container that allows air molecules to pass in and out, such as a simple wooden box, allows for aerobic decomposition that results in much less noxious odor and clean skeletonization. A Chinese lacquer coffin decorated with birds and dragons, from the State of Chu, fourth century B.C.E. Custom coffins are occasionally created; some companies also make set ranges with non-traditional designs. These may include paintings of peaceful tropical scenes, sea-shells, sunsets, and cherubs. Some coffins have been designed to look like gym carry bags, guitar cases, and even yellow dumpster bins. Coffins may also be personalized to offer college insignia or different head panels to better reflect the deceased's life choices. Others coffins are left deliberately blank so that friends and family can inscribe final wishes and thoughts upon it to the deceased. Under some circumstances, an individual or a family member may wish to construct their own coffin. Various do-it-yourself handbooks can be found with instructions on how to carve, craft, and construct a variety of coffins for both people and pets. Much of this literature details both the tools and techniques used in the production of coffins, as well the various moldings, appliqués, linings, and finishes which can be used. ↑ Coffin The Columbia Guide to Standard American English. Retrieved December 11, 2007. ↑ Coffin The Columbia Electronic Encyclopedia, Sixth Edition. Retrieved December 11, 2007. ↑ Bamboo Coffins "Coffin-maker resurrects tradition" BBC Business News. (January 28, 2001). Retrieved December 11, 2007. The Columbia Electronic Encyclopedia, Sixth Edition. 2003. Coffin Columbia University Press. Retrieved December 11, 2007. The Concise Oxford Dictionary of Archaeology. 2003. Coffin Oxford University Press. Retrieved December 11, 2007. The Oxford Essential Dictionary of the U.S. Military. 2001. Coffin Oxford University Press. Retrieved December 11, 2007. This page was last modified on 8 March 2017, at 17:09.